How To Create In-Memory OLTP (a.k.a. Hekaton) Enabled Database and it’s Internals. 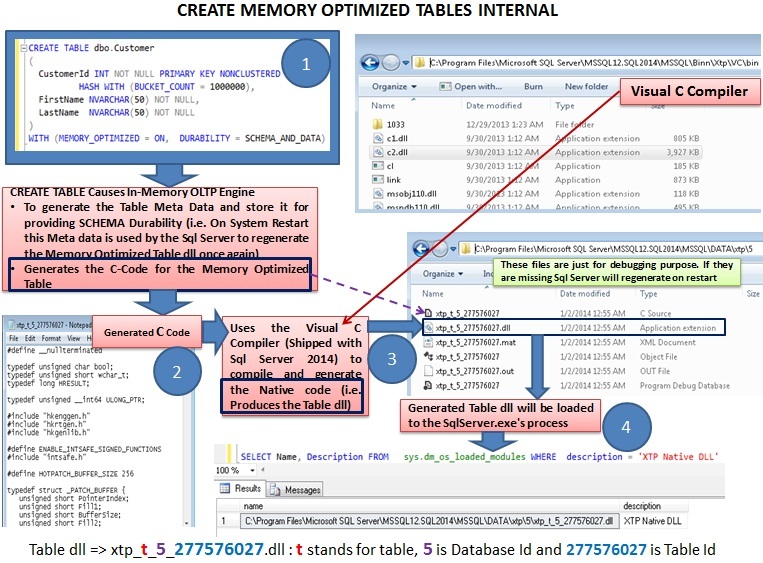 How To Create Memory Optimized Tables and it’s Internals. 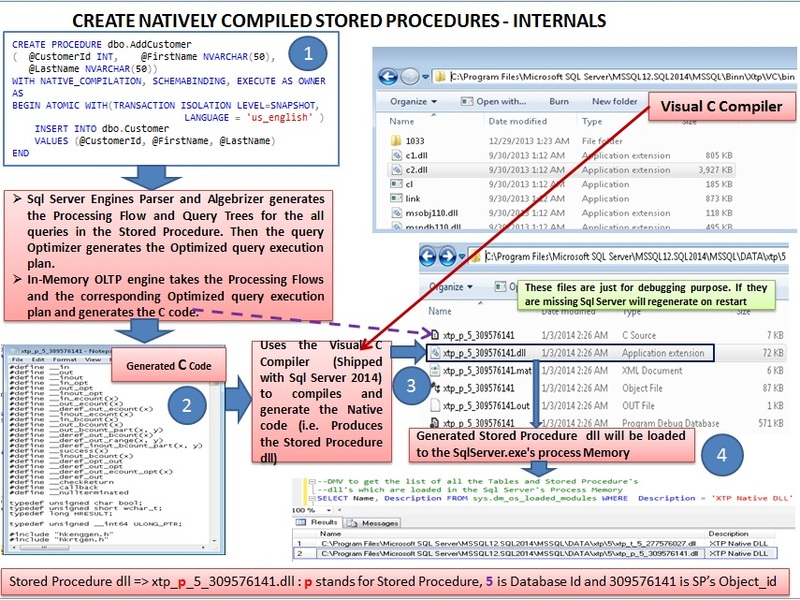 How To Create Natively Compiled Stored Procedures and it’s Internals. Note: The learning experience expressed in this article are based on the Sql Server 2014-CTP2. To support In-Memory OLTP features (i.e. Memory Resident Tables, Natively compiled Tables and Stored Procedures etc), the Database need to have MEMORY_OPTIMIZED_DATA filegroup. We can create only one filegroup per db which can have MEMORY_OPTIMIZED_DATA. This Memory Optimized filegroup can have multiple containers/folders/volumes. Each of these containers will have Durable Memory Optimized Tables Checkpoint files (i.e. 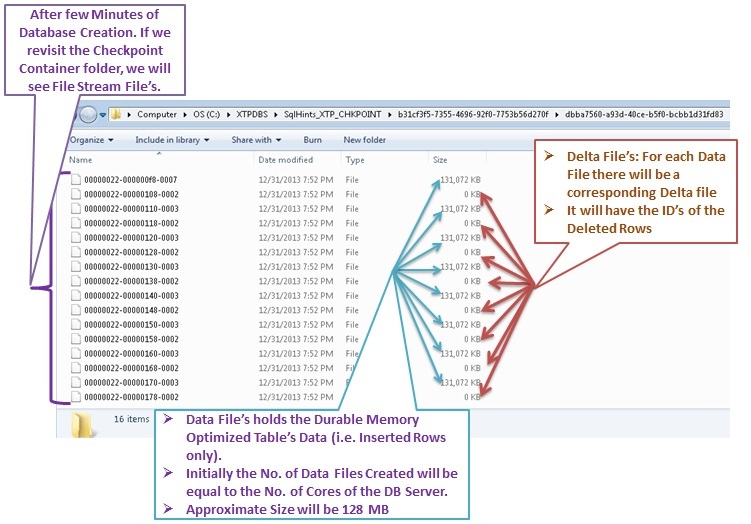 Data and Delta file pairs) containing copy of the Memory Optimized Table Data on the disk. After few Minutes of Database Creation or Immediately after Creating the Memory Optimized Table. If we revisit the Checkpoint Container folder, we will see File Stream File’s as shown below. Already Have a Regular Database? Want to Make them In-Memory OLTP Enabled? Below script demonstrates this converting Regular DataBase to a DataBase which can have Memory Optimized Tables. Memory Optimized Databases doesn’t support Database Mirroring and Replication. But it’s alternative Always-ON Availability Component is supported. It also doesn’t support differential back-up, but it supports Full and log backup and restore. 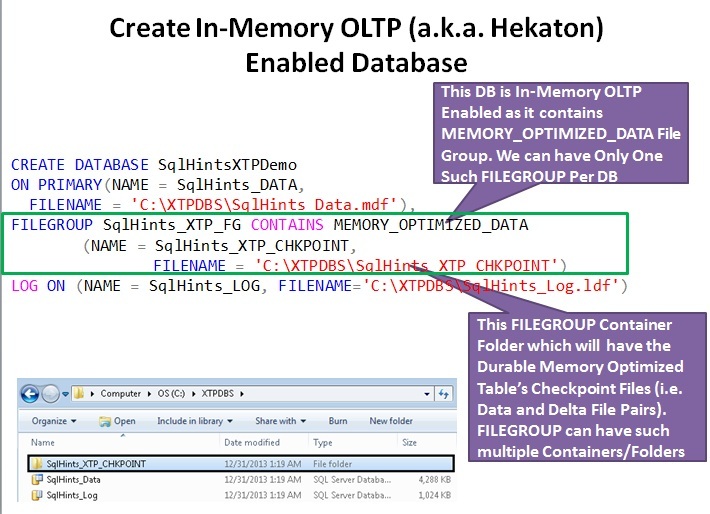 Sql Server 2014 CTP2 can support max 4096 Data/Delta files per In-Memory OLTP database. Combined maximum size of the Durable Memory optimized table data supported by Sql Server is 256 GB. As Memory is Volatile, the Server restart will cause flushing of the Memory Optimized Table data from Memory. In order to provide Durability of the Data for Memory Optimized Tables created with durability option, the In-Memory OLTP engine writes the every committed transaction data to the Transaction log. And whenever CHECKPOINT fires, it will move the data written from the Transaction Log to the Data and Delta filestream file Pairs in the Checkpoint Container. On System restart the data from these check points file’s and the active transaction file is used to rebuild the Memory Optimized table and stream it back to the Main Memory. Data File’s holds the Durable Memory Optimized Table’s Data (i.e. Inserted Rows only). Initially the No. of Data Files Created will be equal to the No. of Cores of the DB Server. 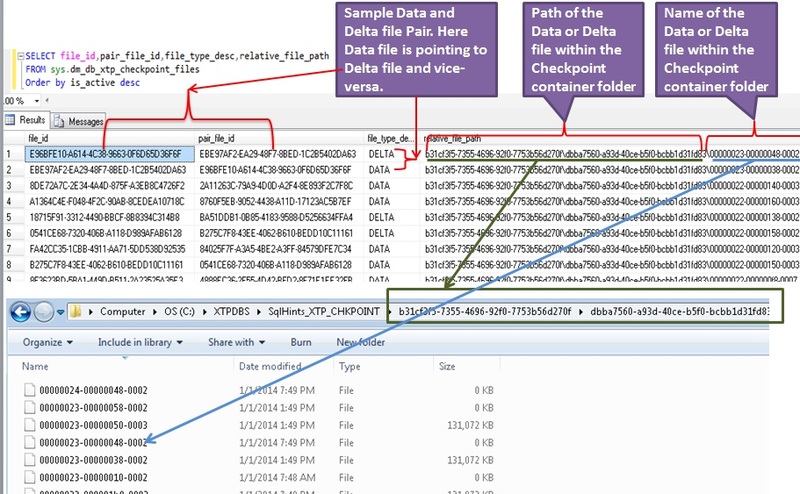 Below image depicts the Checkpoint Files Meta data maintained by Sql Server and it’s Mapping to the Physical checkpoint files on the disk. 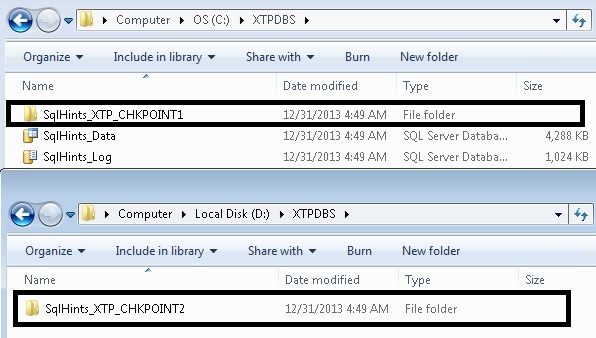 DMV sys.dm_db_xtp_checkpoint_files can used to get the Checkpoint files Meta data maintained by the Sql Server. A database can have Memory Optimized Table’s, only if it is In-Memory OLTP Enabled (i.e. Database need to have MEMORY_OPTIMIZED_DATA filegroup). A database can have both Regular Tables (i.e. Disk-based Tables) and Memory Optimized tables. 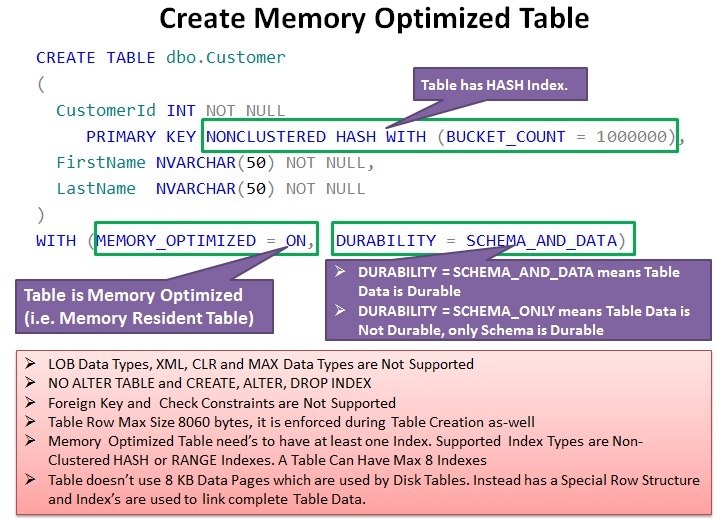 Below is the script for Creating a Durable Memory Optimized Table. MEMORY_OPTIMIZED: This Parameter value ON indicates that the Table is Memory Optimized (i.e. Memory Resident Table). DURABILITY: This Parameter Value SCHEMA_AND_DATA means Table Data is Durable and if it’s value is SCHEMA_ONLY means only Table Schema is Durable and Data is NOT Durable. NONCLUSTERED HASH WITH (BUCKET_COUNT = 1000000): HASH index. Here choosing BUCKET_COUNT is very important, it should be equal to or greater than the possible number of unique values for the index key. It will degrade the performance if this BUCKET_COUNT is less than the number of unique values for the index key. We will discuss on this more in the future articles on the HASH and RANGE Indexes. Table Row Max Size 8060 bytes, it is enforced during Table Creation as-well. Memory Optimized Table need’s to have at least one Index.Memory Optimized Tables doesn’t use 8 KB Data Pages from the extent to store the table data, Instead has a Special Row Structure and Index’s are used to link the rows to get the complete Table Data. Supported Index Types are Non-Clustered HASH or RANGE Indexes. Uses the Visual C compiler (Shipped with Sql Server 2014) to compile and generate the Native code (i.e. Produces the table dll). DMV sys.dm_os_loaded_modules can be used to get the currently loaded Natively compiled Tables or Stored Procedures into the SqlServer.exe process. We can use query like below to get the list of all the Memory Optimized Tables in the current database. Note the Durability column value “0” Means both Schema and Data of the table are durable where as value “1” means only the Schema is durable. Below is the script for creating a simple Natively Compiled Stored Procedure. A Natively compiled Stored Procedure can Access Memory Optimized Tables but not the disk based tables. Because the disk based table’s are not Natively Compiled like Memory Optimized Table and also they don’t provide the routines to access the tables directly like the Memory Optimized Tables. 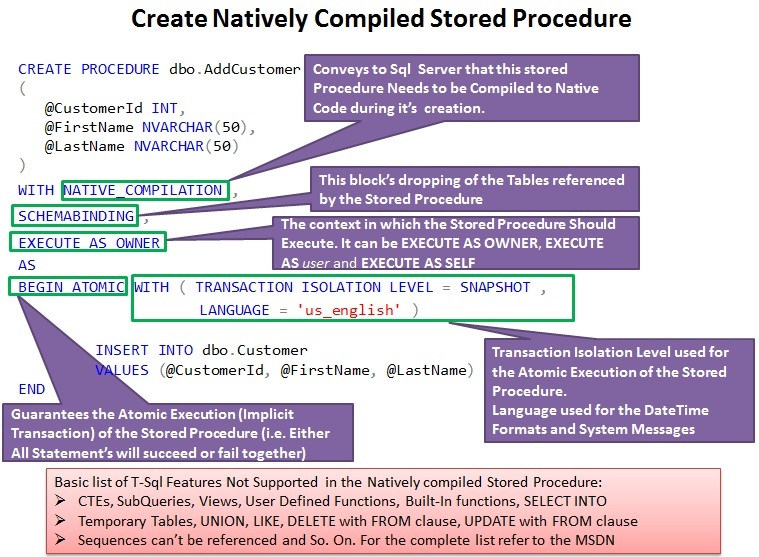 NATIVE_COMPILATION: Conveys to Sql Server that this stored Procedure Needs to be Compiled to Native Code during it’s creation. TRANSACTION ISOLATION LEVEL: Transaction Isolation Level used for the Atomic Execution of the Stored Procedure. When we issue a command to Sql Server to Create a Natively Compiled Stored Procedure. The Sql Server engine’s Parser, Algebrizer and Query Optimizer create Processing Flow, Query Tree for the T-Sql Statement’s in the Stored procedure and then an optimized execution plan is created for all the queries in the Stored Procedure. Then In-Memory OLTP engine Takes this as an input and generates C code and then by using the Visual C compiler the C code is compiled to a native code. The Generated dll will be loaded into the Sql Server’s Process Memory. And when user Executes the stored procedure (i.e. issue ‘s an EXEC) command then first the Sql Server Engine’s Parser & Algebrizer extracts the stored procedure Name and the Parameters and if it identifies it as a natively compiled Stored Procedure then the request is passed to the In-Memory OLTP engine which locates the Stored Procedures Dll entry point. And the dll executes Stored Procedure logic and returns the result. Please correct me, if my understanding is wrong. Comments and suggestions are always welcome. Hi please explain me how i achieved the paging with the in memory tables using the Fetch Offset syntax of sql. before execute the create table? Thank you Dhanabal. Appreciate your comments. Great!! you can find all the information in blog.